History, development & service of floatplanes carried on battleships and cruisers documents a long neglected subject. From 1920s through WWII, aircraft operating from catapults were used for spotting gunfire and scouting ahead of the fleet. Flying these planes was unique and both photos and text cover the dramatic launching and recovery. Colors and markings are detailed. Special attention has been paid to images showing catapult and ship details. 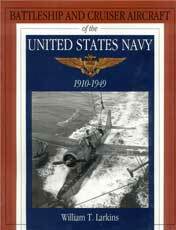 The assignment of all aircraft by type, totals, squadrons and ship is given annually from 1942 to 1949. Includes floatplanes used on small ships and submarine. 272 pgs, HB w/dust jacket, 8.5 x 11, 400+ photos.